Does anyone else find ..because there is a lot of white ...you get marks on the card very easily...i covered her foot up as there was a mark there.. Thanks for looking...enjoy your Day....Lovely here today..Scrabble later ..Yipee!!! This is a super one Sylvie... it really has that extra something! What a beautiful card this is. Gorgeous work. And another gorgeous creation Sylvie! Love all your 3 cards you've made for Less is More and can't decide between them as they are all fabby! Oh! Wow Sylvia, another stunner. Just stunning Sylvie, I love it! Sorry for delay i'd missed a row from the thumbnails! 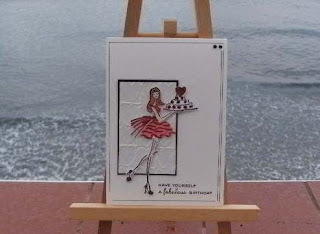 Love the fab image Sylvie, brilliant card. Sylvie, that's a lot of hand cutting..but the end result was definitely worth it! Love that tall elegant girl (wish I was her!!). I like the way she pops off the page. Fabulous!